The Hunt Is On: Massive Collider Churning Out Data The world's largest science experiment, the Large Hadron Collider, roared to life this year beneath the French-Swiss border. It's now churning out mountains of data from high-speed collisions that researchers will scour, trying to find the elusive Higgs Boson, a particle long pursued by scientists. This year the world's largest science experiment roared to life. Deep beneath the French-Swiss border, the Large Hadron Collider, or LHC, has spent the year accelerating subatomic particles to near the speed of light and smashing them together. These collisions are being used to push the theories of physics to their limits. This animation shows a collision between particles in the ATLAS detector at the Large Hadron Collider. Note: the video clip has no sound. "I've been working on ATLAS since 1996," he says. "I was down in that pit when it was completely empty and it was wonderful, it was huge. I have watched the detector being built; I was involved in the research and development and the production and the testing -- putting the whole thing together." Thousands of researchers like him have devoted the best years of their lives to getting the LHC and its detectors up and running. They switched it on with great fanfare in 2008, and collisions were just days away when a faulty connection triggered an explosion in the machine's liquid helium coolant. It was a devastating accident, though Steven Goldfarb, another researcher on ATLAS, puts the best face on it he can. "As a lesson to the world, we arranged for the LHC to have a small explosion so that they could learn about how ... what happens when liquid helium expands," he says in jest. "We didn't really want this to happen, and it set us back for a good year or so." This year, the LHC finally got going, and that means researchers can finally start looking for new particles. At the top of their list: one called the Higgs. Researchers think the Higgs explains the masses of all the other particles. Its discovery would be a major find, and everyone is excited. There's even a song: The ATLAS Boogie. 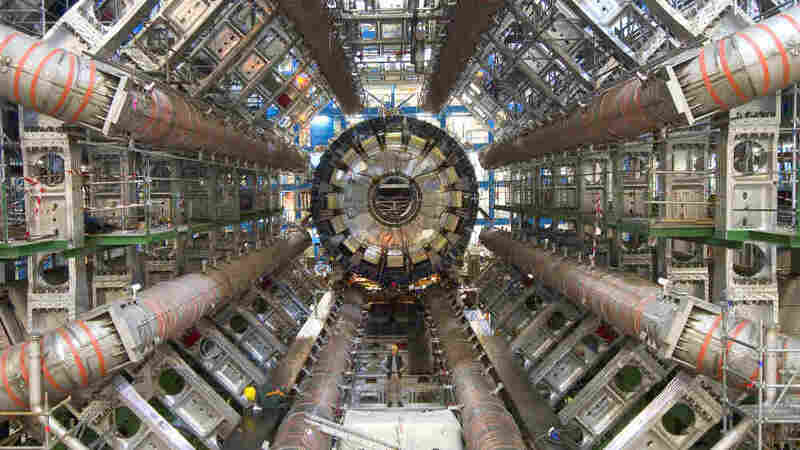 Think of the LHC as an underground racetrack. Instead of cars, the machine uses protons, the positive particles at the center of atoms. Two streams of protons travel in opposite directions around the 17-mile ring and collide inside four detectors the size of buildings. "It's a bit harsh, this comparison, but imagine two cars crashing, and each car's got passengers in it and they crash into each other, and bits fly everywhere, right?" says David Francis, a researcher working on ATLAS. "And then your job is to identify what the cars were beforehand and how many passengers were in each car." Except it's more than just the contents of the cars -- smashing protons together actually makes new particles. Goldfarb likens turning on the collider to turning on the Hubble Space telescope. "When the Hubble turned and looked out into space, they had some ideas what they were going to see, but they also didn't know, and that's probably the coolest part of what we do," Goldfarb says. "Instead of looking out, we're looking in. And we're looking for new things." The LHC produces hundreds of millions of collisions each second, and sorting through all those collisions to find something like the Higgs requires a lot of computers, which are kept inside a two-story building above the ATLAS detector. The interesting collisions get recorded to computers. Even throwing away most of the data from the collisions, researchers still end up with a lot of data. "So if you're looking just down the aisle here, you see 19 racks -- 19 cabinets of computers with 31 computers in a rack," he says. I think if you do the numbers, you end up with a pile of DVDs per year which is higher than the Eiffel Tower in Paris -- something like that," Francis says. Once researchers have those data, they can start to look for the Higgs. But that’s not the only thing they’re looking for. Joe Incandella is hoping they’ll find a mysterious kind of matter called dark matter. He works at the CMS detector, which is five miles away from ATLAS on the opposite side of the ring. "Our galaxy is loaded with this dark matter, but we have no idea what it is," Incandella says. "It's very likely to be heavy stuff that we could produce with the LHC. All the theories indicate there's a good chance we produce it." That's just the start of a list that gets progressively more sci-fi. The machine will study antimatter. It will probe milliseconds after the Big Bang. It could also turn up extra dimensions of space, microscopic black holes or something nobody's even thought of yet. So far researchers haven't seen too much new, but with an Eiffel Tower's worth of data each year, they're optimistic. And after 15 years of waiting, Srini Rajagopalen says everyone's getting down to business. "There are a lot of teams of people looking for signs of new physics," he says. "Finally we have data. This is what we've been looking for, waiting for, for such a long time." Geoff Brumfiel is a reporter with Nature.